It is hard to believe that just a few months ago the snowpack in our region was significantly above normal. While I am grateful for how the snowy and wet winter and spring has moderated the 2017 fire season so far, the recent excessive heat and the smoke in our area (even if it’s primarily from Canada) are reminders of the responsibility we share in reducing our risk of wildfire. Earlier this year, the Legislature unanimously approved my Senate Bill 5546 to begin a long-term effort to help reduce catastrophic wildfire. Passage of this bill would not have been possible without the help and support of committed local leaders, various statewide organizations, and our new Commissioner of Public Lands Hilary Franz, who leads the state Department of Natural Resources (DNR). She has made forest health a top priority and her agency worked closely with me as this important policy change moved through the lawmaking process. More than 100 people joined me, Commissioner of Public Lands Hilary Franz and local officials for a recent Forest Health Summit in Wenatchee, moderated by Rufus Woods. Commissioner Franz joined me for the signing of the bill in Olympia, and on July 31 she traveled to Wenatchee to co-host a local Forest Health Summit. 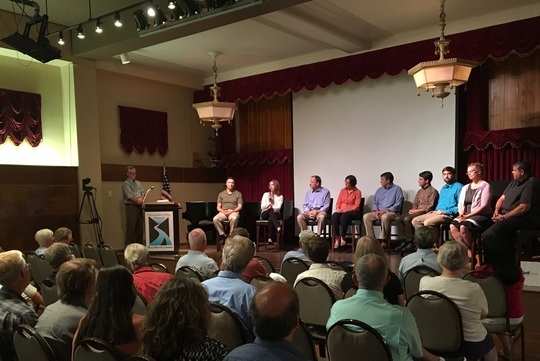 Held at the Wenatchee Valley Museum and Cultural Center, this meeting provided community members a direct opportunity to hear how public and private organizations are joining forces and taking a proactive approach to wildfire management. The summit was – in many ways – an extension of the ongoing community conversation that has been under way since our devastating wildfires of 2014 and 2015. I am grateful to Rufus Woods, Wenatchee World publisher, for moderating the discussion, and appreciated that we began the evening with a 10-minute video from the Wenatchee-based Wildfire Project. This group’s “Era of Megafires” multimedia presentation was a key factor in beginning our important community conversation about wildfire and provided me inspiration and information leading to the new forest health law. About 2.7 million acres of forest in Washington are in poor health and close to half of that acreage is under state or tribal management. The new law directs DNR to set up a framework for assessing and treating the health of the fire-prone lands under its authority. The goal is to treat 1 million acres over 16 years, most likely through prescribed fire and mechanical thinning. In broader terms, the law creates a long-term partnership between DNR and the Legislature. The agency implements the forest health work and provides policymakers (and the public) with regular progress reports. With a new structure of accountability and progress reviews the Legislature will be in a more informed position to keep the much-needed funding coming. A recent development mentioned during the summit was an agreement with the Forest Service that gives DNR “good neighbor authority.” As Commissioner Franz noted, fire doesn’t pay attention to boundaries between state and federal land; the new pact allows DNR to cross those boundaries as appropriate and conduct forest health treatment on federal lands. As I stated in the final thoughts segment of the summit, “Doing big things isn’t easy.” Restoring our state forests to reduce our risk of catastrophic wildfire is a complicated and challenging long-term effort. Fortunately, the communities of North Central Washington have a proud history of accomplishing seemingly impossible tasks. If everyone can continue to engage in thoughtful dialog, accept the challenges ahead, and work together, we can continue to make tremendous progress.